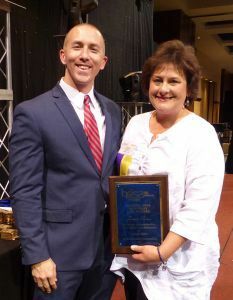 Pensacola State College’s Jennifer Ponson has been named a Florida HOSA Honorary Lifetime Member. Ponson, the college’s coordinator of Student and Program Outreach, and a HOSA Region I advisor, received the accolade during the 2017 HOSA State Leadership Conference held April 6-9 in Orlando. Lifetime membership is bestowed on individuals who have been active members and who are or have participated in HOSA in a professional capacity. “The HOSA Honorary Lifetime Member Award is an honor and I am proud to be a part of the HOSA organization,” said Ponson who has been involved with the organization since 1997 when Pensacola State hosted the Region 1 HOSA Fall and Spring Leadership Conference. Jim Van Allan, chairperson of the Florida HOSA Alumni and Professional Association, described Ponson as a “spotlight” before presenting her with the award. Along with an increasing membership, Region 1 HOSA has grown to three membership levels – Middle, Secondary and Post-Secondary – where students gain experience in team building and learn confidence by working hard. Also, members are recognized for their hard work and gain invaluable life skills such as public speaking and communication. Ponson is quick to acknowledge the impact HOSA has had on her life. To current and former HOSA members, Ponson is so much more than just a mentor. 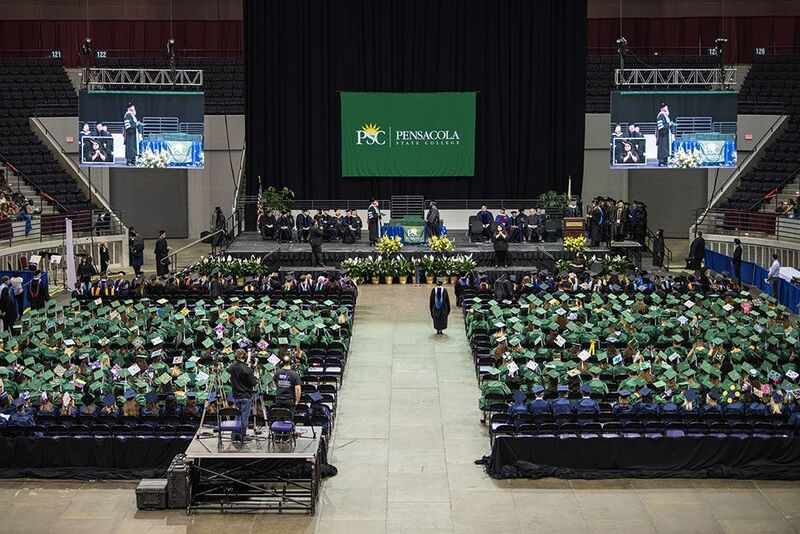 Zac Hastings, a former HOSA member who now works at Select Therapy – PSC on the Pensacola campus, said she encouraged him to reach for the stars. Hastings added the skills he acquired as a HOSA member have helped him professionally. “By being an active member, it helped me improve who I am as an individual. The leadership skills and knowledge that I gained as a member opened many new doors for my career and success. I encourage all young high school and post-secondary individuals who have an interest in healthcare to invest in themselves and be a part of HOSA,” he said. Quentin Harvey-Baker agreed with Hastings. John Hoang, an EMT/paramedic for Lifeguard Ambulance Service, said Ponson helped him achieve his life goals. “Mrs. Ponson believed in me and always encouraged me to be the best at whatever I set out to do,” he said. Theresa Hoang, who works at Pensacola State, said Ponson strives to make each HOSA member a better person. “Jennifer has helped me with HOSA by pushing me into the right direction in Health Education. She strives to make you become a better person, letting you know that you can do whatever you like in life. She has helped build my leadership skills and self-confidence,” Hoang said. Ponson, who also serves on the Florida HOSA Board of Directors, said she looks forward to continuing to work with HOSA.